Viasat Satellite Internet (formerly Exede) is high-speed internet beamed directly to your home from our satellites in space. This means you can get a fast internet connection where you live—almost anywhere in the United States. 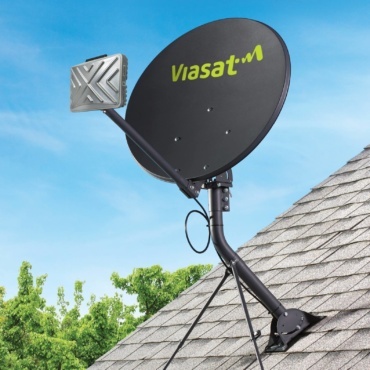 Where is Viasat Satellite Internet available? Who is Viasat Satellite Internet for? How Does Viasat Satellite Internet Work? Your request goes to your Viasat modem, then through a short cable to the dish outside your home. At Last, Satellite Internet With Unlimited Data Plans! If you’ve hesitated to purchase satellite internet in the past because of data caps, the wait is over. plans are the future of satellite internet for everyone, and we offer these plans to subscribers across the U.S., including in Hawaii and Alaska. You can do pretty much anything! Without data caps, you’ll be free to use your internet connection as much as you like without worrying about incurring data overage fees. Unlimited data plans are especially ideal if you regularly play online games and stream movies and TV shows. Swipe left to view full chart on mobile device. *Price does not include applicable taxes, zone charges, regulatory and franchise fees. Services not available in all areas. Contact us for complete details. **For more information on standard installation, please visit www.ykc.com or contact your sales representative.